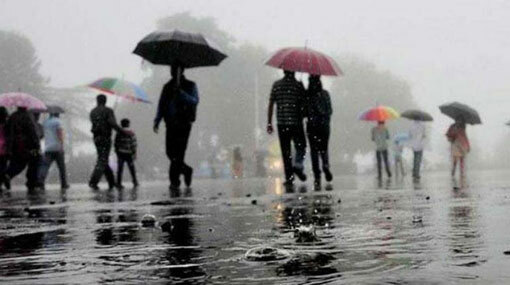 Thundershowers can develop in inland areas after 02.00 pm and will spread to the North-Western, Western and Southern provinces later, the Department of Meteorology said. Heavy rainfall about 100 mm can be expected at some places in Central, Uva and Sabaragamuwa provinces and in Ampara district. Showers or thundershowers can occur at several places over the North-Western, Western, Southern and Northern coastal areas in the morning too. Meanwhile showers or thundershowers will also occur at Western, South western and Northwestern sea areas. Showers or thundershowers may occur at several places in the other sea areas around the island in the evening or night. Winds will be North-Westerly in direction in the sea areas extending from Puttalam to Matara via Colombo and Galle. Winds will be variable in direction in the other sea areas around the island. Wind speed will be 20-30 kmph in the sea areas around the island.